With sample made-up-numberset and spare numbers. Valley Trains/Tren y Cwm - Pair of red Welsh Dragon motifs - Now in 7mm/0 (F7241) as well as 4mm/00 (F4241). Available in white or off white/straw. 4 of each number supplied in 4mm scale sheet FRH4005/27. In addition to our main sheet FRH4814, FRH4814/1X adds some new useful items. We often have commissions from customers for producing transfers for their particular requirements. 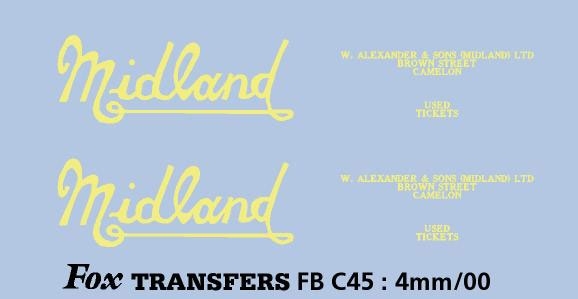 The images below are of such transfers and are now available as stock items. These are in 4mm/00 scale. 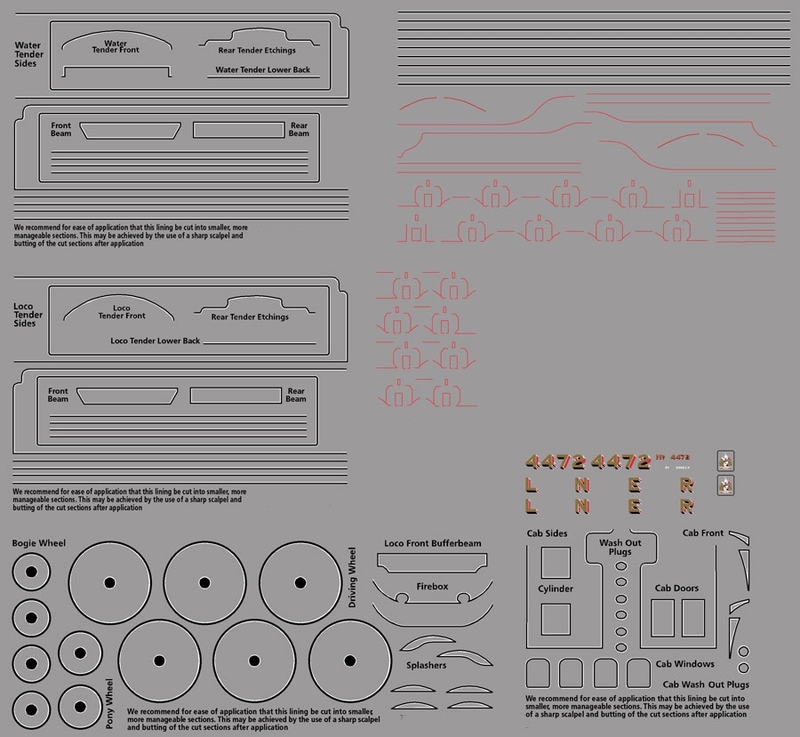 SECR coaching stock details 1915-1922 - available as a single sheet or 2 sheet pack. FRH2475. Midland, Eastern and Western Region Depot Codes are now available in our 7mm/0 range. Click here for detailed information. 5 INCH PROTOTYPE SIZE - SLEEPING CAR, BUFFET CAR AND RESTAURANT CAR to match our existing sheets. 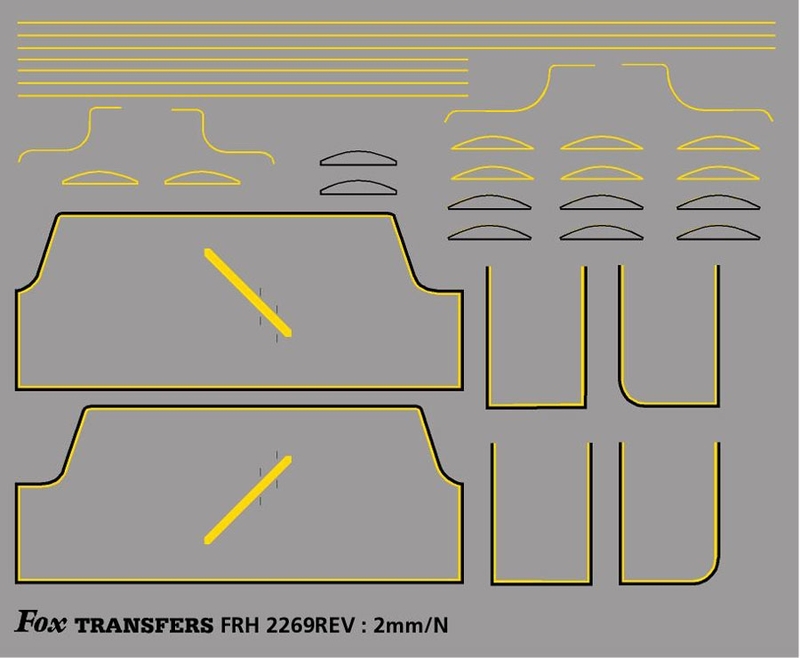 For full series 2mm/N - FRH2320. 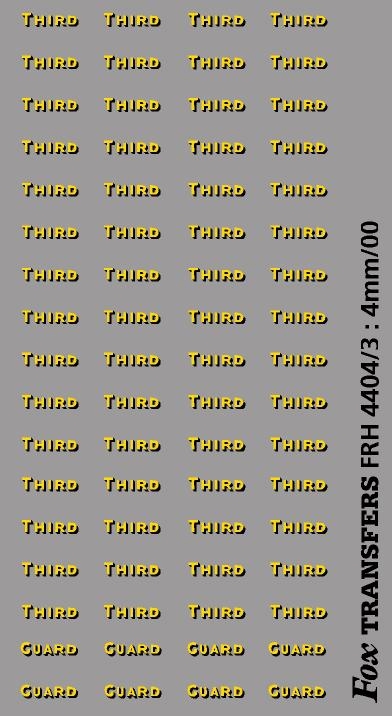 4mm/00 - FRH4320. For full series in 7mm/0 - FRH7320. 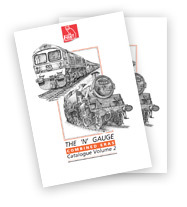 For full series in Gauge 1 - FRH10320. Our latest 2mm/N offering, specfic lining for the A3 Class Locomotives. 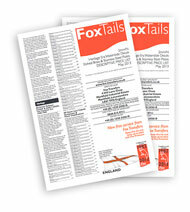 Available as a full pack or separate sheets. FRH2354/10 will show you the options. 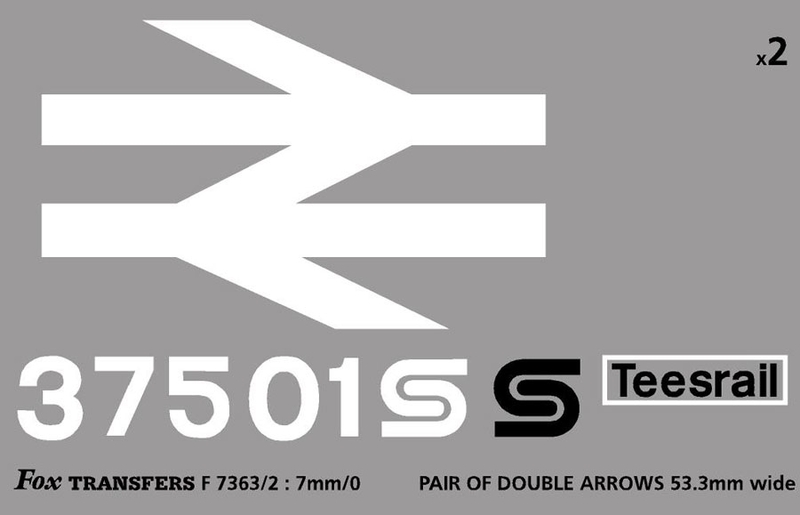 Coach brandings for Class 33 and 73 loco hauled stock.See sheets F7500 and F7500/2 for lettering, coach numbersets and crests. 2mm/N - FRH2434 - MN/BB/WC unrebuilt Loco Lining Set. 2mm/N - FRH2435 - MN/BB/WC rebuilt Loco Lining Set. MANY MERCHANT NAVY, BATTLE OF BRITIAN & WEST COUNTRY CLASS NAMEPLATE SETS ARE NOW AVAILABLE, COMPLETE WITH MULTI COLOURED TRANSFER CRESTS WHERE APPLICABLE. More will be following soon! Available in both 4mm/00 and 7mm/00. 2mm/N version in yellow only. FRH10024 - 8, 9 AND 10 INCH PROTOTYPE SIZE cabside numerals in white only with power classifications. 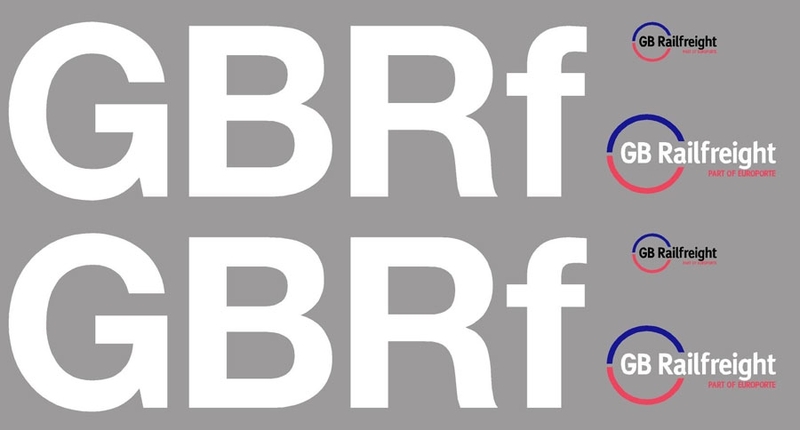 FRH7077 - Revised sheets now single application with all 3 colours in register. FRH10075 - Revised Mied Traffic Lining sheets with straights and mixed radius corners now all printed as single application (all 3 colours in register) SELECT REVISED SHEETS. FRH2076/77 - One Standard Class 5MT 4-6-0 BR1/BR2 Tender Locomotive 73XXX Lining Set or 4MT 4-6-0 BR1/BR2 Tender Locomotive 75XXX Lining Set, Mixed Traffic. BR British Railways Met Cam 101 DMU Cats Whiskers and Dipped Upper Lining. 2mm/N - FRH2269/1REV - LMS Stanier Princess/Coronation Classes 8P 4-6-2 Tender Engine Lining Set . 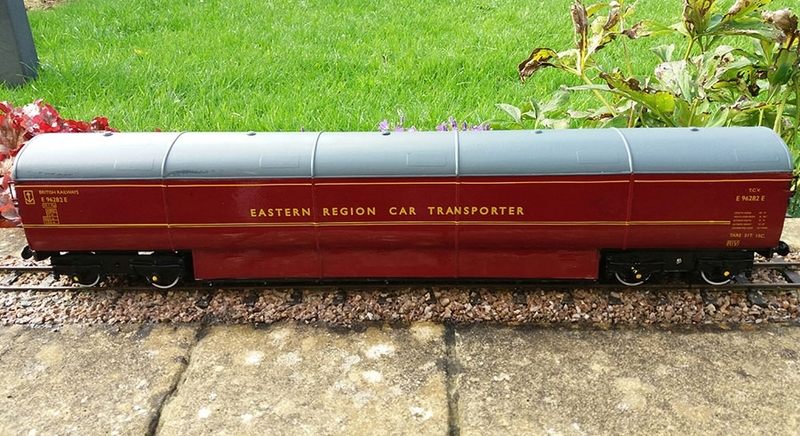 EASTERN REGION CAR TRANSPORTER - FROM CUSTOMERS COMMISSIONS IN 7MM/0 AND IN GAUGE 1-10MM. 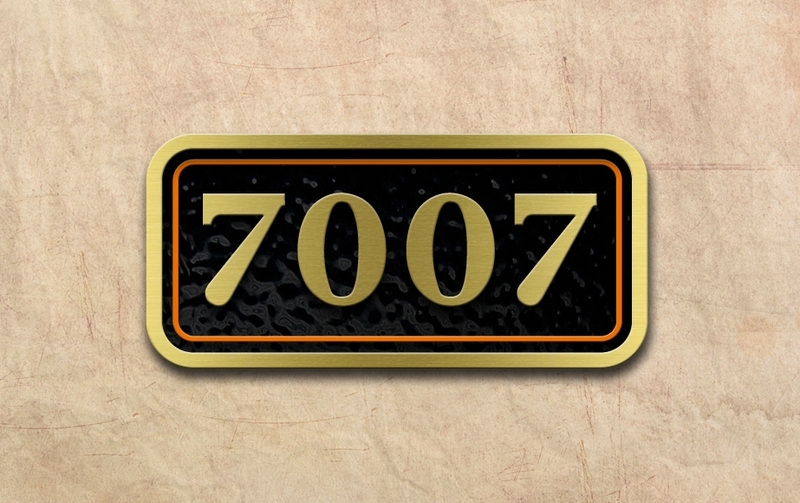 Finish your Great Western/BR Western Region Brass Cabside Numberplates with orange lining to make them even more authentic. Available in both 4mm/00 and 7mm/0. 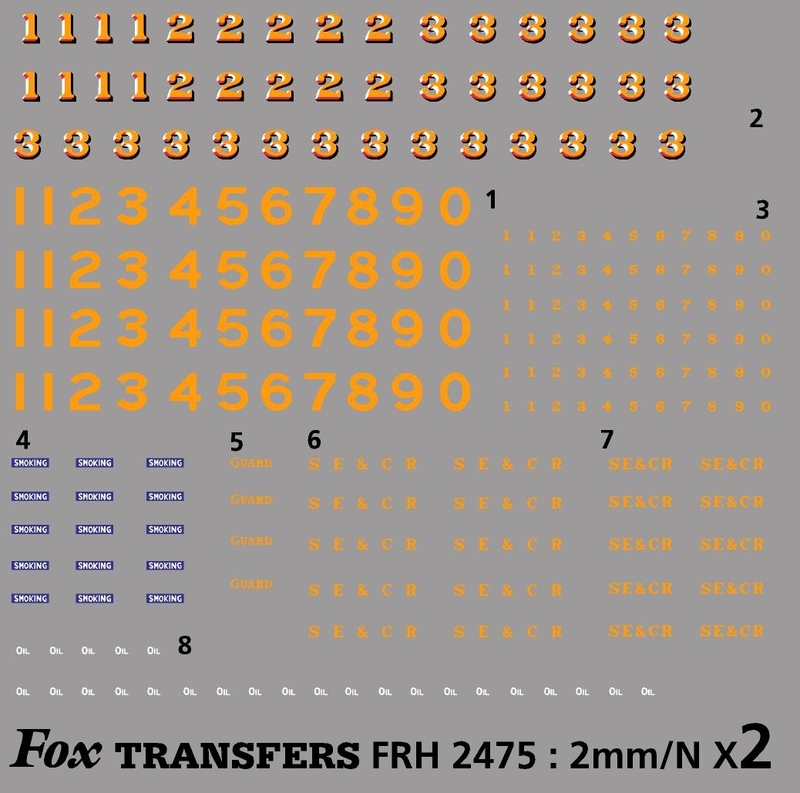 These WATERSLIDE TRANSFERS can be used on Fox Transfers Numberplates or Nameplate sets which include numberplates. 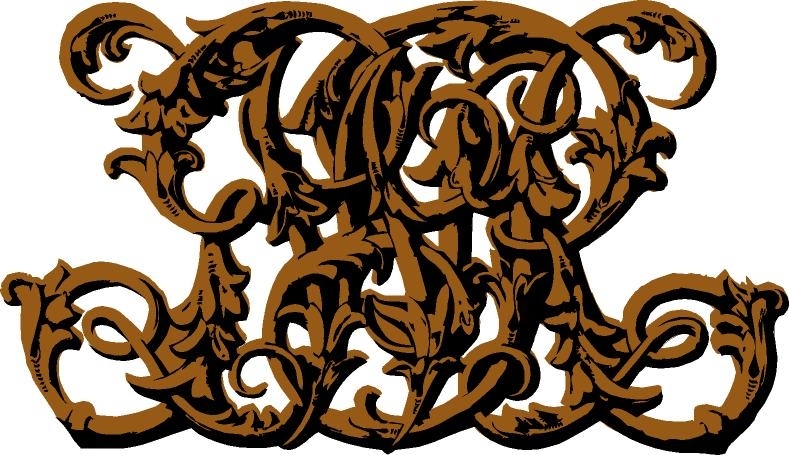 Below is an illustration of how the finished plate will look when transfers are applied. 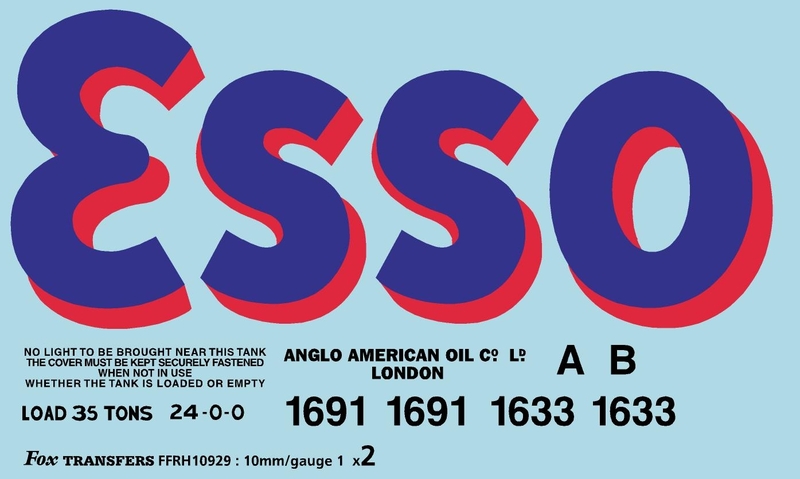 1960/1970s design lettering and small detailing - now available in our 2mm/N range. Click here for detailed information. Private owner plates for wagons. Gloucester Builders, Owners and Repairs plates (6mm x 4.15mm). CHAs Roberts Builders (6.35mm x 3.4mm) 10 pairs of each design. 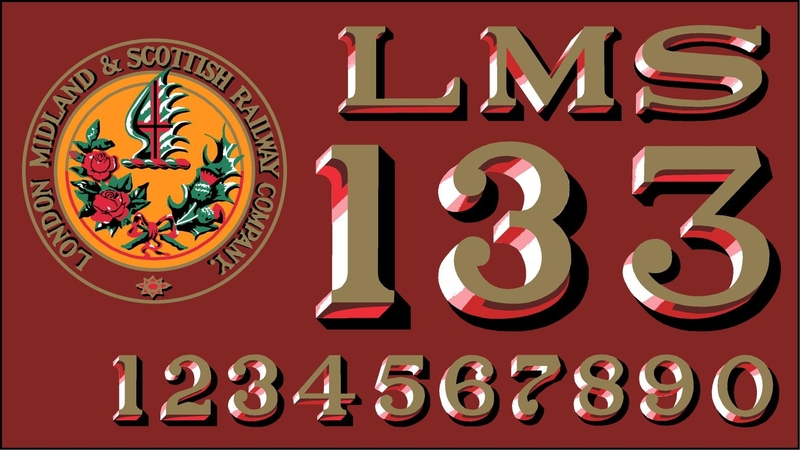 Plus Standard REGISTERED BY L&NWR, GWR, LMS, LNER, SR plates Click here for detailed information. 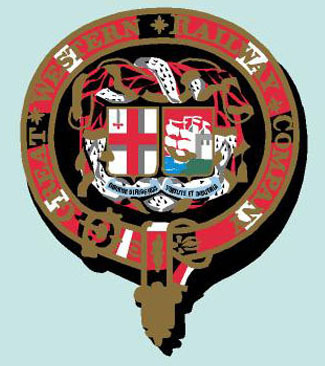 Two sizes of crest are available in all of the modelling scales. 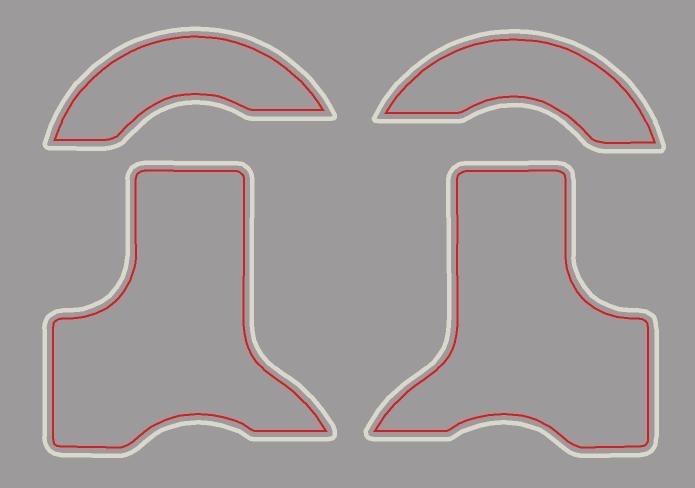 Depending on whether you need a carriage crest or loco splasher crest either the 7.5 inch or 10.5 inch size should accommodate. The precision screen printed representations vary in detail depending on the reproduction size - the larger scales being printed in 8 spot colours. 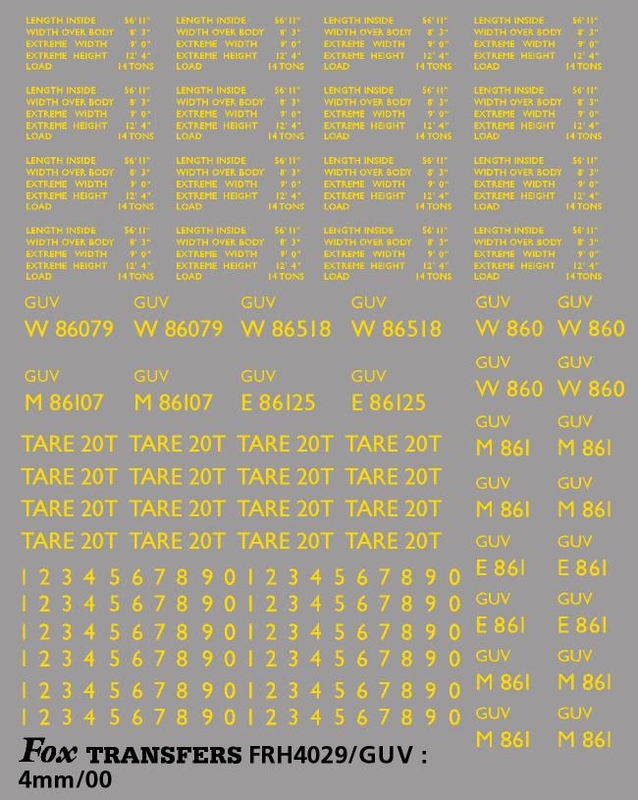 Printed in up to 7 colours (smaller scales may have reduced printing colours) these Waterslide Transfers will transform your GER Locomotives. 4.5 inch size lettering was used from 1882-1885 on Blue Liveried Engines. 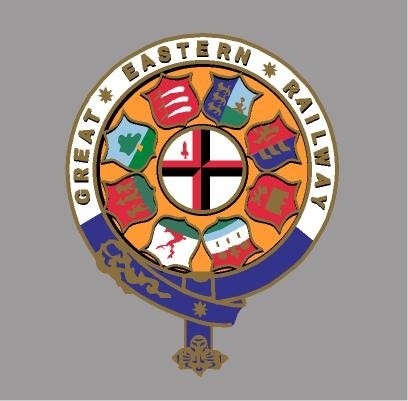 6 inch size lettering was used from 1885; From 1890 the GER Blue Livery was discontinued on goods engines which were then painted black - hence the black counter shading on this lettering would have been invisible. 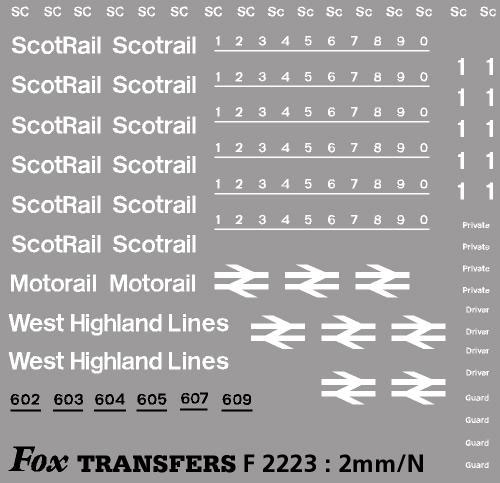 Simplified 2 colour transfers in 6 inch size lettering was used from 1915 until some time after the 1923 grouping on Grey Liveried Engines as a wartime measure. Bufferbeam Lettering and numerals in 7 inch size printed in yellow with chocolate brown drop shadow. These brandings were hand painted on the locos and so sizes did vary. All Waterslide transfers available in 8 modelling scales (PLEASE SELECT YOUR SCALE FROM THE SHOP BY FILTER MENU AFTER CLICKING LINK). LMS 1920s Serif Style Coach Lettering and Numbering. Printed in Metallic Gold, White, Pink, Red, Brown and Black (smaller scales may have reduced printing colours) these Waterslide Transfers will enhance your LMS Coaching Stock. 4 inch size LMS lettering, 3 inch size Coach Numerals and 8 inch size 1st and 3rd Door Classifications. Transfers are available in all modelling scales. Matching coach roundels, which have been in our range for many years, will compliment your LMS coaches too!